ANCIENT MEGALITHIC STRUCTURES in URAL : Little attention is paid to the mysteries of the Ural region. Many articles and films have been made about the pyramids in Egypt, the Maya culture and other phenomena, but not about the legends and sites of the Ural. It is a vast area, and large parts covered with forest. In recent years, many megaliths have been discovered in the Urals: dolmens, menhirs and a large megalithic cultic complex of the Vera Island. Bursting out of a plateau in a remote region of the Ural Mountains – like the gnarled fingers of some giant subterranean monster – the seven rock formations of Manpupuner in the Komi Republic are as veiled in mystery as they sometimes are in snowstorms and fog. Known as the “7 strong men”, or ‘Seven Brothers and a Sister’. these gargantuan stone towers are rightly considered one of the Seven Wonders of Russia, and with its air of inscrutability, Manpupuner draws visitors from across its vast country. From the air it is impossible to see what is on the ground and on the ground it takes an expedition and a lot of resources to reach any location. The location is remote and the climate inhospitable. It is a tourist site in Russia, although not much known internationally. 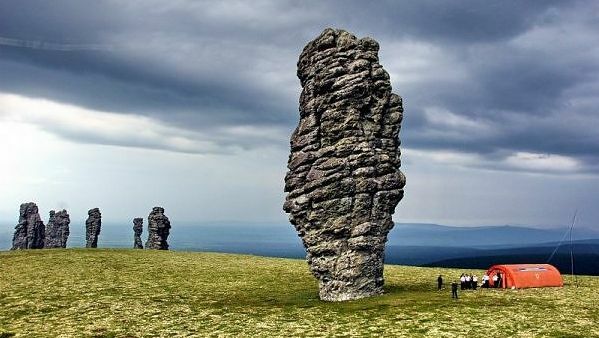 The Ural formations on a mountain top look like statues of giants. The rocks themselves are impossible to climb, even for experiences climbers. They are said to be up to 300 million years old, and it is unclear how they were formed – if they were formed naturally. These Ural ‘statues’ more than 100 feet in height – about a third higher than the Easter Island statues. One formation is thought to resemble a bird. All seem to have their own identity. One rock that stands somewhat apart from the others is called the ‘Big Brother’. Despite all this, Manpupuner – which in the Mansi language means “little mountain of the gods” – is not widely known outside Russia, lying as it does in the isolated and inhospitable north. And while since time immemorial these giant stone totems have been the source of all manner of myths and fables, information regarding their true origins is hard to come by. The great height and unusual shapes of the stone-faced 7 strong men make them inaccessible to even experienced rock-climbers – the marked overhangs projecting out above the heads of people on the ground enough to discourage even the most fearless or foolhardy. There are in fact more than seven formations, but the number seven is widespread in local legends and toponyms. It seems impossible for primitive men to have constructed them. Unless there were actually giants in the Ural at some point in time, who had access to advanced technology that is no longer available today.